Total miles today -- 7.32. Elevation gain was about 900 feet. For the non-Americans out there, that's 11.8 km with 300 meters of elevation gain. First, a few thank-you comments I didn't get to write yesterday. MadRiver, thank you for taking us to fellowship the morning of March 10! Margaret, thank you for the deck of cards - they were very useful at Logan! Teresa, thank you for showing us the way to the Metro in Paris! Icelandair, thank you for having free children's meals and headphones! 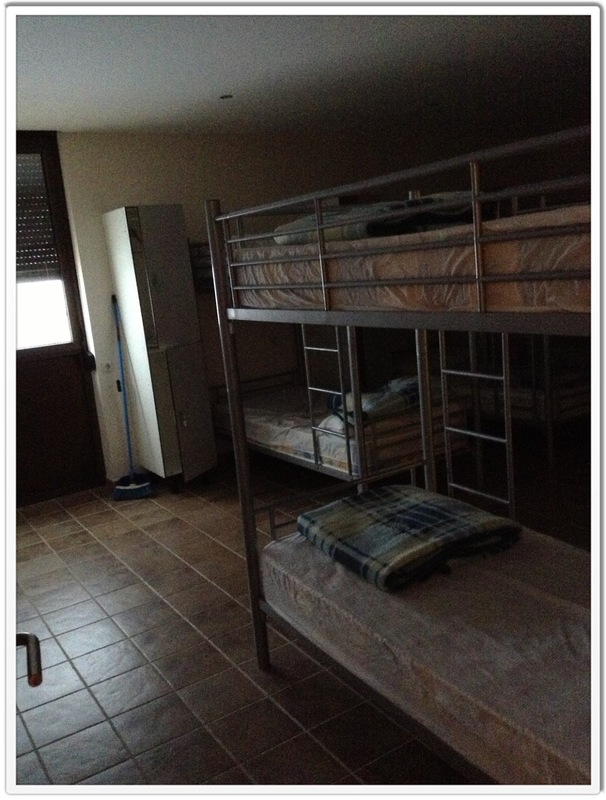 Last night, we stayed at the albergue associated with the pilgrim's office in SJPP. Can't remember the name, but it is just up the street and the number is 55. It was lovely - heated, with blankets, and very clean. The cost per person was eight Euros. That included a breakfast of bread, butter, and coffee/tea/hot chocolate the next morning. We left SJPP this morning at about 8am. There was a bit of snow on the ground and it was lightly sleeting. For us, this was perfect hiking weather. Cool and invigorating. We stayed in our fleece about five minutes before we got hot and stripped down to base layers and waterproofs. Sage's face got cold after a while so she donned her balaclava, but apart from that we were quite comfortable. Remember, we are used to hiking in the mountains of NH in extremely cold weather and deep snow. For us, today's hike felt like a warm winter's walk. 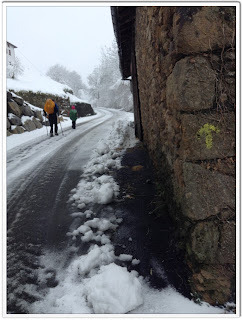 For those of you about to start the Camino who do NOT live in the mountains and who are not used to winter hiking, be sure to bring insulating layers and waterproof shoes or boots. 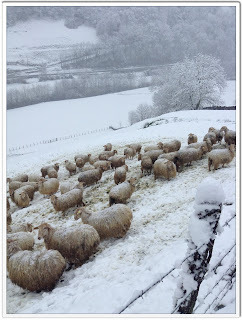 I know there are at least a few fellow pilgrims following this blog who are about to start their Camino - depending on where you are from, what's normal and comfortable to us may not be so for you, so look at the photos below and plan according to your own comfort levels. 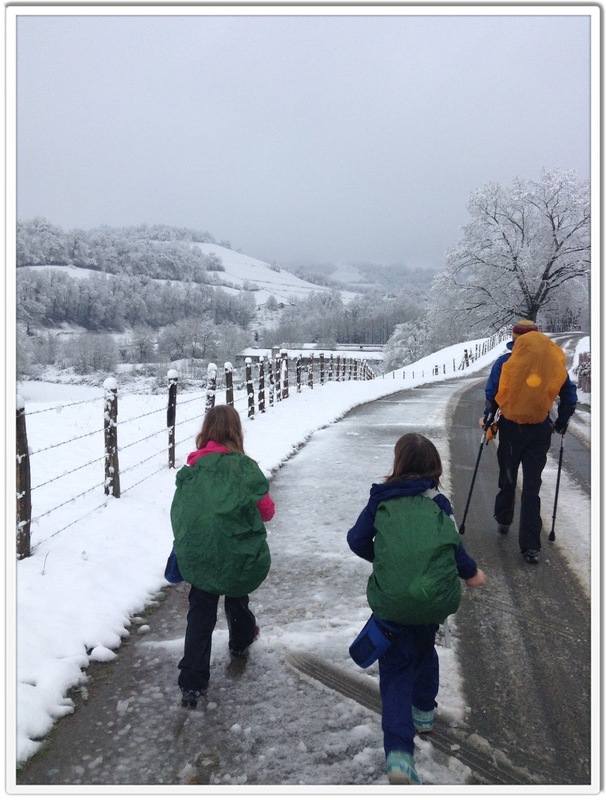 Don't underestimate the weather - remember, we are very used to this and the girls have a substantial amount of winter hiking experience. Below are photos of our trek from SJPP to Valcarlos. We used the country roads (NOT the highway). Snow on the country roads was never more than 1/4 inch deep. 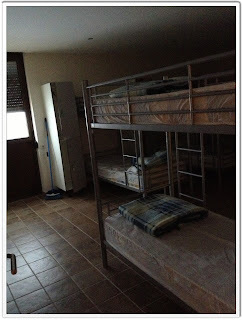 The main albergue is inside a school as soon as you enter Valcarlos. Continue up the road and follow the signs to the Mercado which is open from 8:00 to 20:00. Get the pass code from the folks at the bar. This is a very nice bar, by the way...it's where we are right now. WiFi, wood stove, and there's a convenience store attached. The albergue in Valcarlos is wonderful. Heat, blankets, fantastic showers, kitchen, etc. Hugh will taxi ahead tomorrow and meet us at Roncesvalles, where he will pick up his rented bike. The girls and I will walk. It's steep up tomorrow - for you NH folks, it's like the second half of Tecumseh, but stretched out over a few miles instead of just one. Hopefully the wooded way will be clear enough to walk...if it's not, then we'll have to walk a busy highway which, in my opinion, is far more dangerous than hiking in shallow snow. We'll see what the paths are like...I'll have my compass, extra food, chemical warmers, etc with me. We'll try the wooded way...if the snow gets too deep then we'll bushwhack over to the road. The wooded way intersects the main road a few times, so we can also switch to the road if we make it through one section but don't feel like trying another. The elevation goes up to just under 4000 feet, so we expect NH mountain conditions....kind of. Probably about half the snow we're used to, with the option of road walking it over Ibaneta Pass if necessary. I don't think there's an Internet connection at the albergue tomorrow, so I might not be able to write again until the day after tomorrow. We've met and spoken to many pilgrims. The albergue at SJPP was full! There's Edgar from Germany, Rebecca from NJ (USA), Flo from Switzerland, Jerry from Ireland, Linda and Tara from Florida, and a dozen more whose names I can't remember right now. Everyone is happy and in good spirits. The girls are having a blast. They made a ton of snowballs today and lobbed them at each other as we walked. They enjoy talking to the pilgrims. Alex's Spanish is good, and Sage has lost her usual shyness. They are writing of their experiences in their journals and they are taking a ton of photos. Will write tomorrow if I can. Otherwise, I'll write from Zubiri. Brilliant to hear that - looking forward to following in your footsteps! Like you, I don't fancy walking on a main road if the actual Camino is safe so hopefully there will be even less snow in a fortnight's time. Buen camino! I am following your Camino adventures and loving your photos. I forgot to ask - how long did it take you to walk from StJPdeP to Valcarlos? Looks like you're getting along well! I am following your trek with keen interest and can only wish I was there doing my own Camino. It looks like you guys will have a wonderful experience. We are preparing for El Camino del Norte in May 2014 so I can't wait. My teenage son and I will walk it and my wife will meet us along the way. Very excited. Please keep posting. Buen Camino, peregrinas. Oh My! So excited to be following your adventure! Roncesvalles looks absolutely magical in the snow. You give me hope for when the granddaughters are olde enough to bring along! Only about 8 more years! Another reason to keep at it for now. Buen Camino, from NJ!